Well, the opening night of Day 1 of our 2015 season is a wrap! There is never not a busy day around here. Especially on opening day. Last minute touch-ups of the wagon. Errands to run into town for the items we should have gotten yesterday. Wagons to be washed. Harness to wipe down. Horses to be fed, watered and washed. Stalls to be cleaned. Crews to be fed, kitchen to be cleaned. Cameras to be charged. Racing shirts taken out. Oh my gosh, I hope I have everything in order…and if not, the show still goes on. Amongst all the busyness, I did take time for myself and went out for a power walk. I headed to the grandstand first, to do four sets, up and down all those stairs. It’s a workout, I tell you. Then off to the trails I went. Totally enjoyed it with the sun shining down. Yesterday I managed a trip off the grounds to do a few loads of laundry and to pick up some groceries. I never really care to venture too far away from camp. Especially in a busy city such as Grande Prairie. But someone’s gotta do it, and I’m it!! We had some little visitors come by the other day. 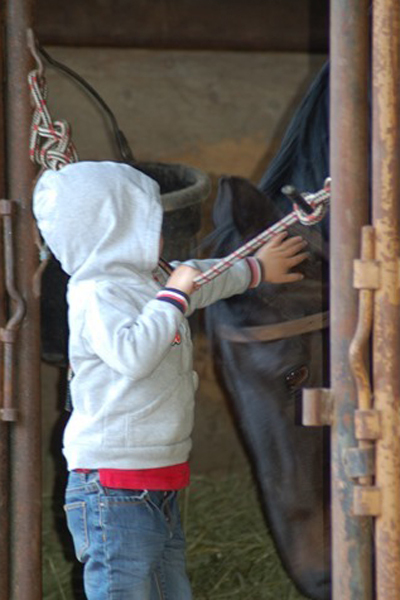 My nephew Kyle and his wife Kiley Rae brought their little ones down to visit us and the ponies. 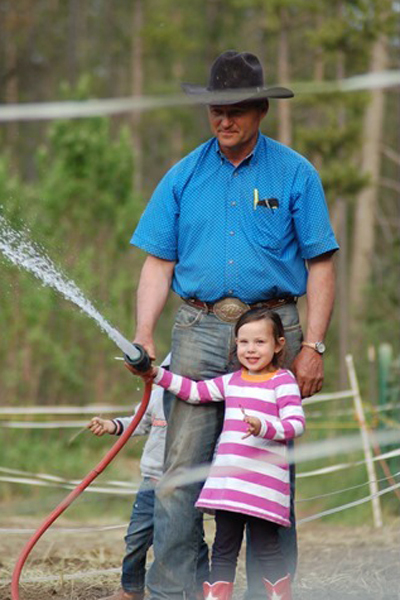 They helped Uncle Ricky water the dusty pens and helped out in the chore department. I so enjoy all the little kids. They warm my heart. While in the trailer preparing supper at 3pm, I heard some pitter patter, and it wasn’t the kids coming to visit. It was a soft rain that turned into a downpour for at least an hour. Enough to dampen the dust and make a few puddles. At first, I was sure it was going to settle right in for the evening, but as it turned out, it quit and just cooled off. First night racing jitters were among many camps. 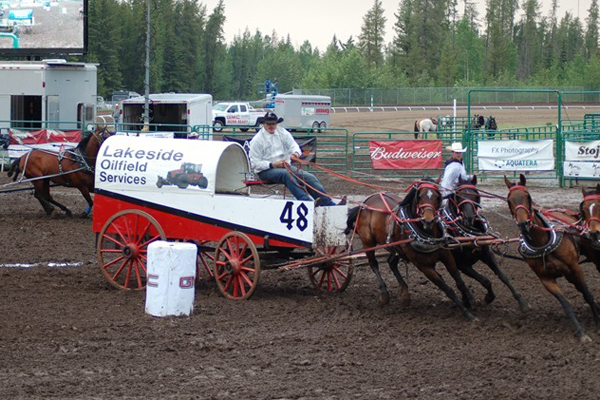 Drivers and outriders alike look forward to getting the first night out of the way and getting down to business, so to speak. But before Rick hooked up, we were busy little bees, helping our son Cody hook his outfit to go race. 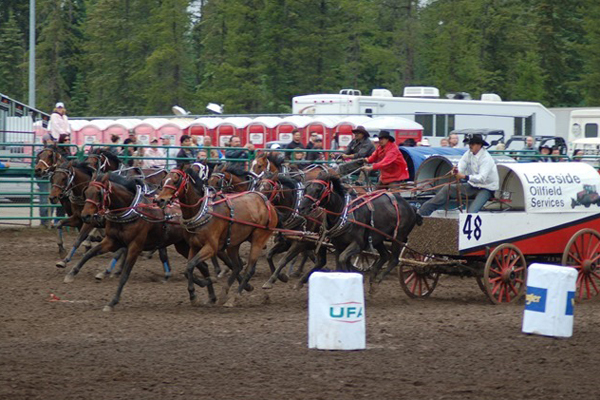 Cody entered a team of our horses in the Western Chuckwagon Association. I thought he faired pretty good, coming off the number 1 barrel, but when his time was announced, he was assessed a 3-second penalty for being a bit too wide over the chalk line. Proud of him just the same. As for Ricky, our hook tonight was Left Lead – Speedy, Right Lead – Nickel, Left Wheel – Sneakers, and Right Wheel – Law. Our outriders tonight were Rory Jarvais holding the leaders on Ace and Dustin Gorst throwing the stove on Andy. With Rick being on 4 barrel, his outfit comes into the infield first to sit at the barrels to then wait for the next three wagons to set up. 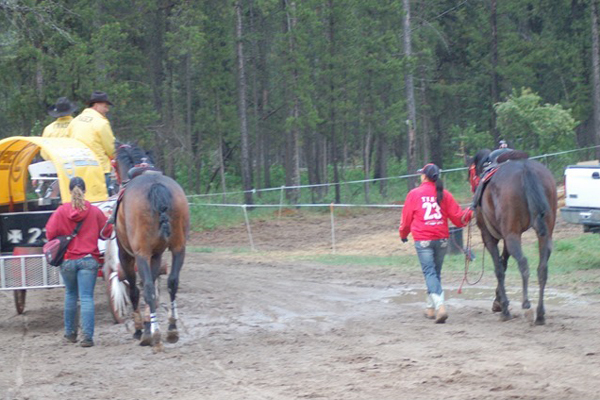 The few seconds wait can seem so long when you have four beautiful and powerful thoroughbreds wanting to run. When the horn sounded, and Ricky whistled, those horses bore down and went like a freight train. Boy, did they bolt around the top barrel and hunt the track. So well, in fact, that they beat Jason Glass on 3 and Kirk Sutherland on 2, and came right up alongside of Kurt Bensmiller, who was off of barrel 1. Rick and Kurt duelled the front end all around the track, with Kurt taking the win by maybe a nose. Gotta love those tight finishes as they are great crowd pleasers. We ended up with a running time of 1:19.94, good enough to put us fourth on the day. Evan Salmond took home day money with a time of 1:19.04. Congrats to him and his crew. 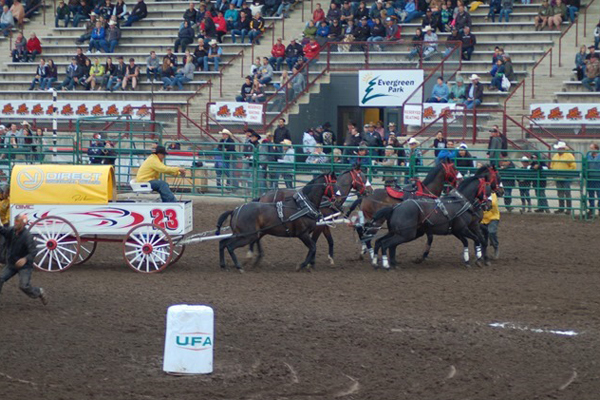 Day two of the Grande Prairie Stompede can be heard live Thursday night, May 28, on Rural Radio on SiriusXM Channel 80 or on Country 99 at 99.7 FM out of Bonnyville starting at 9:30pm Eastern, 8:30pm Central, 7:30pm Mountain Time. As you get older you will understand more and more that it’s not about what you look like or what you own, it’s all about the person you’ve become. Keep up the good runs, and good luck, points in GP are off to a good start. Love your blog Sue! Good luck to all tonight. Are “48” and “23” football/hockey jersey numbers? As for Cody, yes, it was his football number from High School. Glad to get hooked up on your blog, especially way down here in Ecuador SA. Being from Teepee I sure do miss all the real time excitement at this time of the year. If Rick’s barrel #1 hook is as impressive as his #4 he will be just fine. Isn’t the internet a wonderful tool in keeping people together? So glad you can follow along on my journey.